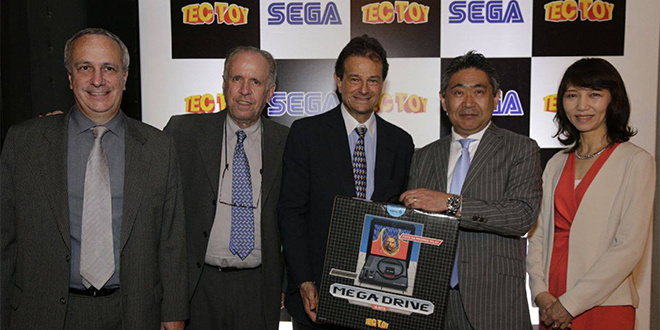 Brazilian firm TecToy has enjoyed a long and prosperous relationship with Sega which dates back to the days of the Master System and Mega Drive, and this year the firm is celebrating 30 years of partnership with the Japanese gaming legend. TecToy has already confirmed that it is producing a new version of the Mega Drive / Genesis system this year, and last week the first of these units was handed to Tsurumi Naoya, Executive Vice President of Sega Sammy Holdings, at a special event. Shipments to consumers are due to begin this week. During the presentation it was also confirmed that TecToy is releasing a new game for the console based on the popular "Monica" comic strip. 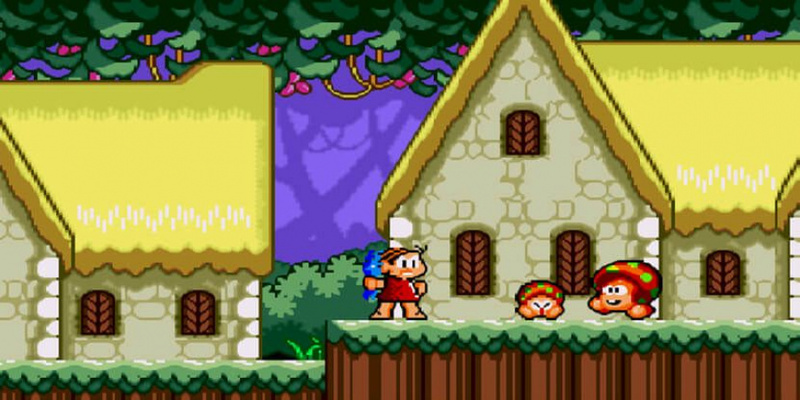 The first game in the series was released in 1994, and was a modified version of Westone's Wonder Boy in Monster Land. 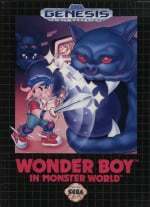 In keeping with this tradition, Monica in the Land of Monsters is based on the Mega Drive title Wonder Boy in Monster World. TecToy CEO Stefano Arnhold also revealed that his company wanted to reprint Ayrton Senna's Super Monaco GP 2, but that copyright issues prevented this from taking place. The late Senna remains massively popular in his native Brazil and products bearing his likeness are regulated by strict licensing agreements. Given that TecToy operates almost exclusively in Brazil it's unlikely that we'll see this new Mega Drive system officially released elsewhere, but there are already plenty of official "clones" available if you're keen on that kind of thing. Let's see if handle this better than Nintendo did with the NES Classic Mini. Brazil? So we may as well forget about it. Seeing a brand new version of the classic Mega Drive is so cool. It also makes me want a SNES Classic Edition (Mini) even more. Please bring this internationally, I will buy it! Brazil is an advance country for sure. Latest tecnology here. Why have I never heard of these official Sega "clones"? I want one. It's lovely to see one made to look like the beautiful original console, but no RGB or HDMI out is a bit rubbish. I'm assuming it isn't really a Mega Drive inside but a system on a chip clone thingy that doesn't replicate the games perfectly like all the other clones. Ah well, easy enough to pick up a second hand original Mega Drive anyway (not a big fan of the MDII which I currently have)..
@Ebefren At least we can get a Nintendo Switch for a very affordable price: US$550,00. US$150,00 for a mega drive is a steal, we must buy! Bring it out of Brazil and into Americas and UK, it will sell. Ha, new Monica game? Now I'm interested. @LegacySmikey I don't recall saying you were immature, apologies if I did! TBH I think I would pick the Master System over the NES myself, but that's because the system was just so much bigger in the UK! My first console was the mega drive/ genesis. I would if they did a remake with wireless pads and 4 player without the expansion thingy. A resolution booster would be nice too but I have no idea if that's possible or not. but what chu really know bout dat tectoy dawg? @ogo79 they licensed most of the video game stuff in Brazil back in the 80's/90's, after that they kinda died out, and now produce mainly low quality stuff. I wouldn't trust this genesis to last very long, not worthy of a 150 usd pricetag, at all. @AlphaJaguar They won't. SEGA already has a partnership with AtGames, a Chinese game manufacturer for international distribution. I already have an American SEGA Genesis, Model 2. The Sega Genesis/Mega Drive was the true winner of the fourth generation. Yes, the numbers will say that the SNES sold more in the end, but the Genesis/Mega Drive refuses to die. Of the countless retro systems, the system can still find its way into stores in 2016 in several forms. Amazing that the Genesis/Mega Drive has endured this long so many years after the Fourth Generation. yep i knew all that myself. @BezBot Lol... Brazil is already a part of Americas, it's in South America. If you live in Europe and North America, you already had a TecToy equivalent, it's called ATGames. Reminder: this is (at least internally) a cheap clone console with poor quality video output (composite only) that only works on Brazilian TVs (PAL-M only). There is no point trying to import this product. It would cost you less money to buy a real Genesis in good condition, which will be better in every way, not to mention actually work on your TV. ugh altered beast. that's just embarrassing. AND HIS NAME WAS AYRTON SENNA!! this thing looks pretty good actually. even if the tech inside isn't a good replication of the original, it's nice to look at. Shame its only AV out and has hardwired plug, and has a 3 button pad not 6. But they certainly got the look pretty much perfect. Also, I bet it isn't compatible with Mega CD or 32X. I'm still waiting for an all in one unit that plays all 3, or ideally for retro styled new repro versions with modern reliability and HMDI. I'd buy this. That is really cool. As a Brazilian expat living in south England I find it highly amusing NL did an article on TecToy - I thought the company died long ago! @samuelvictor Master System was my first console and is the one I'm most nostalgic for. I agree that it had some fabulous games which still stand up today: The Wonder Boy games, Castle and Land of Illusion, Lucky Dime Caper, R-type, Shinobi, the Sonic games, Psycho Fox, Alex Kidd in Miracle World, Alex Kidd in Shinobi World, Ultima IV, Miracle Warriors, Ys, Spellcaster, Golvellius, California Games, Fantasy Zone 1 & 2, Phantasy Star, Rampage, Rastan, Ninja Gaiden, Master of Darkness... Many of the platformers with 16-bit versions were kept simple and clean on the MS and in many ways hold up better than their 16-bit cousins. @BionicDodo You are speaking my language man. So many classics there. And yes, I'd agree that often the cleaner simpler versions of game graphics hold up better today than 16bit versions that just used extra colours and pixels for the sake of it but ended up being messy and indistinct. Sometimes, even the more streamlined control scheme was better, with other versions needlessly trying to justify extra buttons. Perfect examples would be Fantastic Dizzy and Cosmic Spacehead, easily the best versions of those games, far superior to Megadrive, PC and Amiga versions. Of course there are plenty of fantastic 16 and 32bit games on the Megadrive/CD/32X and I love that system too. But overall, the Master System is very competitive when you include all the later games that the US missed out on. It pains me that the last game they got was Sonic 1. @samuelvictor Growing up in London everyone I knew had a Master System and I only ever played NES in Fenwick at Brent Cross Shopping Centre. They had Duck Hunt and Mario. Didn't get a MD until about 93 so played games like Castle of Illusion and Sonic for years on the MS first. Basically, my parents were reluctant to get me a games console at first, as my father felt I should learn to program on a proper computer, which I did. We had a Commodore PET (waaaay more basic than a C64) which basically had no games - just the occasional green screen only Space Invaders and Pacman clones. However, upon playing Sonic the Hedgehog on my friends Megadrive in 1991 I became obsessed with Sonic, and started buying all the comics, magazines, guidebooks etc to the game, and learning how to play the music on piano. This lead to me programming my own basic but actually damned impressive port of Green Hill zone to the Commodore, which I guess showed my dedication to my dad. Eventually by 1993 he relented and bought me a Master System 2, as he couldn't afford a Megadrive, but by 1993 the Master System and games were very cheap, so this was a good decision for us. I loved it dearly and amassed at least 40 games. In 1995 I had a lump sum of money from my Grandmother, and used it to finally get a second hand Megadrive with 32X, and shortly thereafter a MegaCD as well, and caught up on all the games I'd wanted but not been able to get. Yeah I was pretty late to the party, but by that time amazing games were available second hand for a few quid each, as everyone was trading them in for Saturn and PSX. (I remember clearly only paying £3.99 each for Virtua Fighter, Virtua Racing DX, Doom, Knuckles Chaotix, Sonic and Knuckles, Gunstar Heroes, Sonic CD Batman Returns CD, Final Fight and others all in the same day!) I think with £300 I got at least 50 excellent games, which lasted me happily until the N64 was finally released in 97. I desperately wanted Mario 64, but for years it was the only game I could afford on the system. Didn't matter though, I lived in that game for 6 months at least! [EDIT] Oh, BTW, Castle of Illusion is vastly superior on the Master System to the Megadrive. And Land of Illusion is even better. One of my favourite platform games for any system, period. @samuelvictor Good story on your entry into console gaming. I think I actually picked up a second hand Mega Drive in '94 when I got my first part-time job. Think the only new console I got between the Master System and Wii was the N64. We were lucky to get a Master System and a few games at the end of the 80s as I had two brothers so we could get joint Christmas presents. Got ours with Altered Beast (not good) and Wonder Boy in Monster Land (fabulous). Felt like we had a huge game collection but I think that's because everyone we knew had a MS and we rarely bought the same games as each other so we did a lot of borrowing and playing at other people's houses. Happy times. I bought a lot of Master System and Mega Drive games later on from places like CEX (or Tottenham Court Road Computer Exchange as it was) when 3D was all the rage and retro gaming was still a fairly young thing and all the games were under £3 as no one wanted old 8 or 16-bit 2D 'junk'. Just found this picture. £56 in '93 is £105 today's money. And people said Bombermain on Switch was pricey! 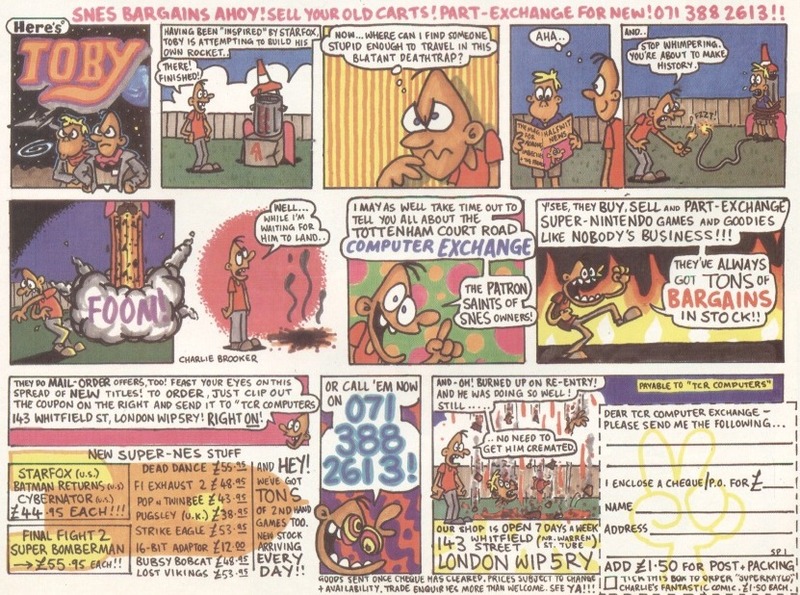 @BionicDodo Yeah man, those £3 games in 95-99 were amazing! People were literally giving away 8 and 16 bit stuff which just a few years earlier I had lusted over thinking I could never afford it! @samuelvictor I meant to mention Asterix. Great game. I can hear the music in my head right now. Loved all the secrets. Still play that game every once in a while. @BionicDodo Awesome. Yeah, really nicely designed game. Loads of secret stuff to discover and loads of variety. @jancotianno WTF you talking about ?!?!? !